Inspired by high student performance and dramatically improved growth toward their goals in 2014, the School District of Janesville administration and school board decided to apply for The Wisconsin Fast Forward Award. The Wisconsin Forward Award program is a division of the Wisconsin Center for Performance Excellence. The award is Wisconsin’s premier award for workplace excellence. To serve as a working tool for guiding and improving organization planning and improvement. 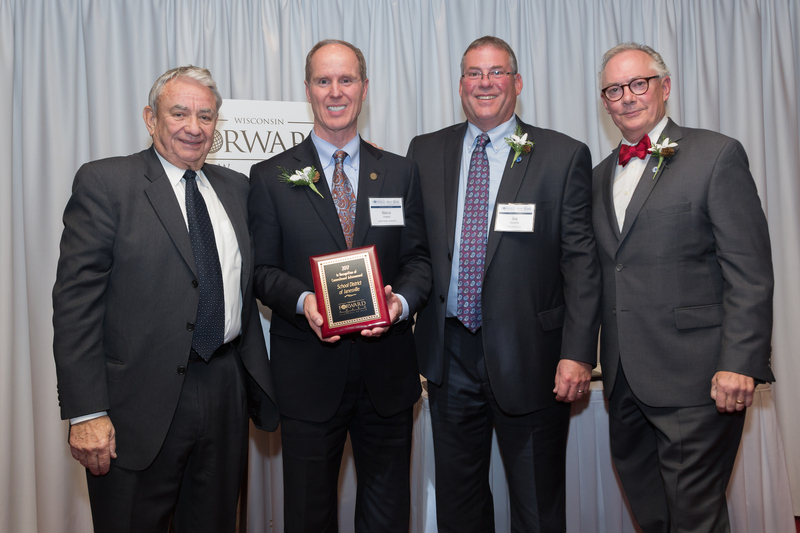 In November 2017, the School District of Janesville was formally recognized and awarded The Wisconsin Forward Award for its Commitment Achievement. Only one other school district, West Bend, received recognition. In fact, the other award recipients were comprised mostly of corporations and companies, some of which spent 10+ years working on their applications. The School District of Janesville’s application process led by Kathy Boguszewski and Ann Roe spanned three years. The process included writing an SDJ Communication Strategic Plan, and writing and publishing an SDJ Strategic Plan that linked the Board of Education’s goals and promises to specific on-going programs and desired outcomes. In addition, Kathy and Ann led all of the SDJ departments in discussions and workshops to identify strengths, core competencies, work processes and most importantly how each program and process delivers results and value for SDJ’s customers-- students and families. SDJ administrative and school staff and leadership were involved in identifying programs, linking outcomes to processes and providing countless hours of research, background information and support for the application which included 7 distinct areas of focus with detailed questions whose answers included data, statistics and extensive narrative. After completing the nearly 80-page award application, SDJ staff and administration waited for an external review panel to complete its analysis. Panel members are from all areas of industry and often, not education. It is the prize at the end of the long road. That feedback from the external review will sharpen the district’s focus and significantly help the District move closer to mastering the use of self-assessment and the Baldrige/WFA Criteria. Since SDJ has some of its key processes documented in various formats, including favorable measures/results, SDJ is well positioned to use comparative data and to trend results. The goals for participating in the review process are to improve SDJ organizational performance, increase transparency and communication, share best practices, and use the application process as a planning and improvement tool.